Back when I was learning to be a witch there weren’t many books around teaching witchcraft for beginners. Most were daunting doorstops of books. What I wanted was something that taught exactly how to do things like casting a circle in simple, easy-to-follow terms. The book I found that hit the right note for me was Circlework: A DIY Handbook of Practical Ritual by Shan of House of the Goddess. I was so impressed that I later signed up to do one of her training courses. What I liked about Circlework most of all was that it had a single-page step-by-step guide to casting a circle. I soon learnt to do that without referring to books, but as a young and very inexperienced witch I felt I needed simple instructions. Shan’s book is long out of print – and probably somewhat out of date too. In recent years I have mainly recommended Kate West’s The Real Witches' Handbook: A Complete Introduction to the Craft to those wanting to learn to be a witch. Many books aiming to teach the basics of witchcraft have been published in the past decades, but I still felt there was a gap in the market for a really practical and easy to follow book for those wanting to teach themselves the craft. Until now, that is. The Green Wiccan Book of Shadows is a new book by Silja, who writes the Practical Magic column for Spirit & Destiny magazine. I’ve just finished reading it – and it is going to force me to rewrite my guide to the best books to buy to learn the basics of witchcraft. The "Book of Shadows" part of its title comes from the name for Wiccan's personal collection of spells or a coven's standard collection of rituals and seasonal rites. Wiccans are witches who follow the kinds of traditions started by Gerald Gardner and Alex Sanders. The Green Wiccan Book of Shadows, however, is primarily aimed at inexperienced witches practising the craft on their own - known as solitary witches. What I really like about it is that it distills long-winded Wiccan ceremonies into very basic, but powerful, spells and rituals. It begins with briefly explaining the background to magic and its important concepts - such as the fact that witches usually try to work with the powers of the sun, the moon, the seasons and the four elements of earth, air, fire and water. After that, the bulk of the book is a collection of simple but useful spells. For example, an easy spell to attract love is to wear a rose quartz next to your skin; to attract money you could plant basil next to your front door; to remove negativity from a room cut a lemon in four, put a section in each corner and, when they have gone black, bury them a long way away. At the end is a great section on Wiccan rituals - including a one-page basic ritual that includes a beautifully simple circle casting. Publisher Cico Books says on its website: "Celtic Wiccan High Priestess Silja covers the basic and intermediate levels of magic for solitary witches. She shares a wide-ranging array of spells that have been successful for her – not least how to attract more love, money and luck into your life. With an easy to difficult rating system, she makes it simple for anyone to learn basic spells and then progress. Silja shares meditations – from energy-raising exercises to vision quests and guided meditations you can do with friends – and shows you why rituals are not just for coven use." 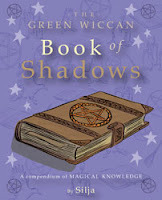 If you are struggling to find your way as a novice solitary witch, or just want to learn what witches do and maybe cast the odd spell from time to time, then do take a look at The Green Wiccan Book of Shadows. It should certainly teach you the basics without either being too simplified or too daunting. Silja has previously written The Green Wiccan Year and The Green Wiccan Herbal.